Guatemala - Undiscovered Central America! Plan on arrivlng today at the International Airport La Aurora (Guatemala) where you will then be transfered to the wonderful ancient city of Antigua. The official tour will then start with dinner tonight. If you wish to have a more relaxed start and spend a day looking around this fascinating and very safe city then we suggest arriving a day earlier. Night in Antigua, Guatemala City. This morning we will explore the hills that surround this beautiful city, where on a clear day 13 volcanos can be visable through the early morning mist. Our brief introduction to the birdlife in this area could include Bushy-crested Jay, Rusty Sparrow, Elegant Euphonia, Grey Silky-Flycatcher, Black-vented Oriole, Golden-olive Woodpecker and even Black-headed Siskin. The nearby slopes of Agua Volcano are home to Ocellated Quail, Lesser Roadrunner, Blue-throated Motmot, White-eared Ground-Sparrow and Rusty Sparrow. After breakfast we will move on to the small paradise of Finca El Pilar, a private reserve where we will search for new species such as Black-capped Swallow and Slate-throated Redstart, whilst on the hummingbird feeders we hope to see Rufous Sabrewing, Beryline, White-eared and Magnificent Hummingbirds. The vegetation of this reserve is mainly constituted by coffee, as well as stands of pine and oaks, nestled at an altitudinal range from 1,710 to 9,500 feet above sea level. A short walk on the network of trails in the forest may reveal Western Tanager, Ferruginous Pygmy-Owl, and both White-naped and Chestnut-crowned Brush-Finches amongst others. We will then return to Antigua to have lunch. For those that wish we will have a thrilling cultural tour of Antigua visiting the magnificent churches, ruins and museums that combined with the old cobbled streets provide stories and legends of the colonial times that undoubtedly you will enjoy and which will make your morning unforgettable. We will be visiting the most important areas of Antigua like La Merced Church, Central Park, the Santa Catalina Martir famous Arch of the 5th Avenue, and much more. For those that do not want to see this wonderful city we will arrange one of our guides to revisit El Pilar to see what other species you can find. Dinner will be in a local restaurant in Antigua. Night in Antigua. Today we have an early start as we depart Antigua and head toward the Tecpan area. We will stop for another superb breakfast near to the Tecpan Private Reserve after which we will take a walk on its forested trails where we hope to see some of the more interesting species associated with the highlands of north Central Amercan. Pride of place will undoubtadly go to the unforgettable Pink-headed Warbler, while other species we will look for include Blue-throated Motmot, Mountain Trogon, Rufous-browed Wren, Hooded Grosbeak, Rufous-collared Robin, Chestnut-sided Shrike-Vireo, Blue-and-white Mockingbird, the Guatemala race of Hairy Woodpecker, Steller's Jay, and if the shrubs are in flower maybe Garnet-throated or Amethyst-throated Hummingbird. During migratory (winter) season you will find many Townsend’s Warblers plus Wilson's, Black-and-white and Red-faced Warblers together with resident Slate-throated Redstart, Pink-headed, Crescent-chested and Olive Warblers, as well as Hutton's Vireo. In the afternoon we will leave and head for Huehuetenango where we will spend the night. Todos Santos is a region with a unique landscape in Guatemala, which combines sub-alpine meadows, rocky areas and slow-growing vegetation due to climatic conditions and altitude (3,850 meters). It is one of the geologically oldest areas and has the highest mountain formations of Central America. This is one of the areas with the greatest biological diversity and endemism in the country, where a number of endangered species of flora and fauna can be seen like Guatemalan Fir, Hartweg's Pine, Huitum, Maya Mouse, and Cuchumatanes Salamander among others. Avian species related to this area are Black-capped Siskin, Golden-crowned Kinglet, Broad-tailed Hummingbird, Common Raven and Savannah Sparrow. Once we are finished here we will transfer to Todos Santos National Park, which is the best site to see Goldman’s Warbler, this specie will be our first endemic species and is located in a small area in Huehuetenango and easy to spot in this park. Afternoon transfer to Quetzaltenango and birding at Las Fuentes Georginas where we will target Fulvous Owl and Mexican Whip-poor-will. Night in Quetzaltenango. This morning we will go birdwatching in the very humid sub-tropical forest at Fuentes Georginas. In addition to being a great birding destination Fuentes Georginas is a hot spring with pools. Here we hope to spot Wine-throated and Garnet-throated Hummingbirds depending on how many flowers are out, Cinnamon-bellied Flowerpiercer, Ruddy-capped Nightingale-thrush, Brown-backed Solitaire, Rufous-browed Wren and very rarely the mythical Horned Guan has been spotted here. Pink-headed Warblers can be at eye-level perfect for photographs, while other species including Unicolored Jay, Guatemalan Pygmy-Owl, Emerald Toucanet and Black-headed Siskin can be found. At midday we will transfer to San Rafael al Pie de la Cuesta for lunch before making our way to Los Tarrales. We will spend these nextnights at Los Tarrales Eco-Lodge. Los Tarrales Reserve represents one of the most important areas for conservation in Guatemala, as it protects pristine cloud forest around the upper slopes of Atitlan Volcano, and at lower levels broad-leaved forest and coffee plantations. Our first morning will see us take an early coffee or tea and then transfer to an area where we will look for the rare and endangered Azure-rumped Tanager, a species restricted to just a tiny area in Guatemala and Mexico. 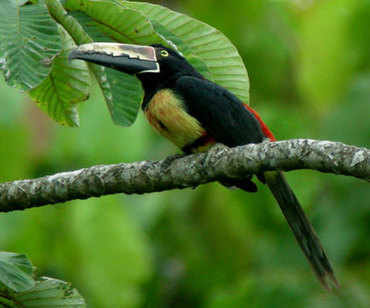 Also here we may see other species such as Rufous Sabrewing, Emerald-chinned, Blue-tailed and White-bellied Hummingbirds, Smoky-brown Woodpecker, Tody Motmot, White-throated Thrush and Red-legged Honeycreeper. We will then take a super breakfast high amongst one of the coffee plantations where Prevost's Ground-Sparrows are regular, and with luck we could also see Buffy-crowned Wood-Partridge. This a great spot to look for raptors and we would hope to see King Vulture, Black Hawk-Eagle, White Hawk and Laughing Falcon. while Pacific Parakeets fly overhead. Birds such as Rufous-browed Peppershrike, Long-billed Gnatwren, Yellow-bellied Flycatcher, Western Tanager and Painted Bunting can all be seen here as well. Returning to the lodge for lunch we will take a little time to look around the cabins where we can see Cinnamon Hummingbird, White-throated Magpie-Jay, and possibly roosting Mottled Owls. We will then spend the afternoon walking a trail at nearby La Laguneta where we will look for species such as White-bellied Chachalaca, Yellow-naped Parrot, Rufous-breasted Spinetail, Rufous-naped Wren, Blue-throated Goldentail, White-eared Ground-Sparrow and Long-tailed Manakin. Night Los Tarrales Eco-Lodge. Time for coffee before taking a look at several areas within walking distance from our cabins such. In an area of woodland and bamboo we will search for the tint Tody Motmot and check the fruiting trees for tanagers and hummingbirds, as well as Pacific, Orange-chinned and Orange-fronted Parakeets. A walk to a nearby pond could find us Green Kingfisher and Least Grebe, while the forest hold species such as Northern Potoo, Black-and-white Owl, Turquoise-browed and Blue-crowned Motmots, White-winged and Yellow-winged Tanagers, Yellow-throated and Scrub Euphonias, Spot-breasted, Altimira and Baltimore Orioles, Golden-fronted Woodpecker, Black-headed Saltator, Melodious Blackbird, Ivory-billed Woodcreeper, Long-tailed Manakin and much more. In fact Los Tarrales has recorded over 350 species of birds and is also a haven for mammals, butterflies and dragonflies. After lunch we will transfer to Lake Atitlan where we should have some time for birding in the late afternoon. Our wonderful accommodation set beside the picturesque Lake Atitlan makes a superb base to explore this area and just around the gardens we can see Painted Buntings and a host of wintering north american migrants. Night at Posada Santiago. 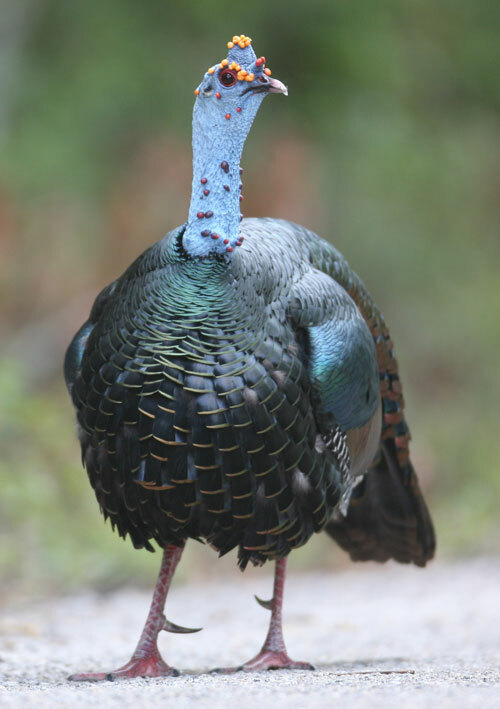 Note: Todays tour to look for Horned Guan requires a resonable amount of effort and fitness as you will need to hike a steep trail for between 1 - 3 hours to reach the site. For those not wishing to do this hike you will bird the lower elevations with one of our guides. Today we will take a boxed breakfast and indeed boxed lunch in preparation for our quest to see the mythical Horned Guan. Depending on the time it takes to reach our birding spot which should be around 2 hours for reasonably fit persons then how long it takes us to find the Horned Guan. Our guides have 100% success rate at this relatively new site to date. We could be back by lunchtime, but in case it takes longer we are bringing a boxed lunch. First thing after coffee in the morning we will take a boat ride toward San Pedro La Laguna and continue by pickup truck the beginning of the trail at Paquisis. Note that this is a relatively new site found by the local guides and eliminates an all day trek to Volvan de Pedro where most people try and see the guan. This is probably the easiest and most reliable site to see this rare and mythical bird. We will climb the hill to reach the site looking for other interesting species such as Prevost’s Ground-Sparrow, Amethyst-throated Hummingbird, Garnet-throated Hummingbird, Slender Sheartail, Rufous and Violet Sabrewings, Bushy-crested Jay, Olive-sided Towhee, Chesnut-sided Shrike-vireo, Rufous-browed Peppershrike, Mountain Trogon, Bar-winged Oriole and Ocellated Quail among others. At the higher altitude where the Horned Guan can be found we can aslo see Black-throated Jay, while our return journey puts us in the habitat for the rarely seen Belted Flycatcher. Depending on our return time we may have time for some local birding around the lake edge or hotel gardens. Night at Posada Santiago. This morning we will be birdwatching on the western slopes of Atitlan Volcano at Rey Tepepul. This subtropical humid forest at an altitude of 1800 metres gives us a second chances to see Resplendent Quetzal, as well as other species such as Yellow-naped Parrot, Blue-naped Chlorophonia, Elegant Euphonia, Azure-rumped Tanager, Slender Sheartail, Bar-winged Oriole, Crested Guan, Emerald Toucanet, Chestnut-sided Shrike-Vireo, White-eared Ground-Sparrow, Green-throated Mountain-Gem, Paciific Parakeet and Rusty Sparrow. Mid morning we will transfer to the dry scrub at El Rancho where we spend the afternoon searching this very fragile and threatened biome characterized by dry scrub, cactus and thorn plants. Some of the species we will be looking for include Russet-crowned Motmot, Lesser Ground-Cuckoo, White-lored Gnatcatcher, Altamira Oriole, Ash-throated Flycatcher, Stripe-headed Sparrow, Canivet's Emerald and Hammond's Flycatcher. Night at Hotel Camino Largo. This reserve is located in the central valley of Guatemala, between 700m and 1000m and is characterized by the abundance of cactus and thorn plants and is home to a different mix of birds. The dry scrub should be more productive early in the morning and allow us to catch up with any species missed yesterday and some of the key targets include Lesser Roadrunner, Turquoise-browed Motmot, Ash-throated Flycatcher, White-lored Gnatcatcher, Streak-backed Oriole, Yellow-billed Cuckoo and Stripe-headed Sparrow. After lunch we will transfer to Biotopo del Quetzal. Night at Posada Montana del Quetzal. In the morning we will have another opportunity to find Resplendant Quetzal from Los Rachitos Reserve. This beautiful place often has quetzals right beside the dinning area and on a good day you can be sipping coffee and watching one of the most beautiful birds in the world. Feeders attract Unicoloured Jays while the surrounding forest plays host to numerous species including Highland Guan, Slate-coloured Solitaire, Collared Trogon, Violet Sabrewing, Grey-breasted Wood-Wren, Tufted Flycatcher, Black Robin, Yellowish Flycatcher, Black-headed Nightingale-Thrush, Eye-ringed Flatbill, Bushy-crested Jay, Chestnut-headed Oropendola, and a host of warblers. We then have a 4 hour drive to the airport followed by a short flight to Flores where we stay for the night. This very pleasant town is actually on an island on lake Petén Itzá and is joined by a causeway. Night at Hotel Isla de Flores. After breakfast we leave Flores for a trip of approximately 3 hrs. The whole road proposes great birding opportunities where we can see a wide range of species in open areas, secondary forest and ponds. Possibilities include Yucatan and Ladder-backed Woodpeckers, Lesser Nighthawk, Plain-breasted Ground-Dove, Vermilion Flycatcher, whilst amongst the wetlands and marshes we could see Least Bittern, Pinnated Bittern, Grey-crowned Yellowthroat, Purple Gallinule, Northern Jacana and Limpkin, plus Snail Kite, Lesser Yellow-headed Vulture, Western Osprey, White-tailed Kite, White-fronted Parrot, Fork-tailed Flycatcher and White-collared Seedeater. We will then arrive at the community of Paso Caballos where we will board a boat that will carry us through the San Pedro River towards Las Guacamayas Biological Station (aprox.20 minutes). Birding along this beautiful calm river will give us opportunities for many species such as herons, kingfishers, Limpkin, parrots, Grey-necked Wood-rail, and much more. On our arrival, we will be received by the EBG staff and they will give an introduction on the wildlife of the station, as well as details about their research programs, conservation and social projections. You would possibly expext a research station to be rather basic but this wonderful place is anything but. It is pure luxury in the jungle, a wonderful lodge with superb accommodation and excellent food. After lunch we will take the first of several boat trips visiting even quieter sections of the nearby rivers. 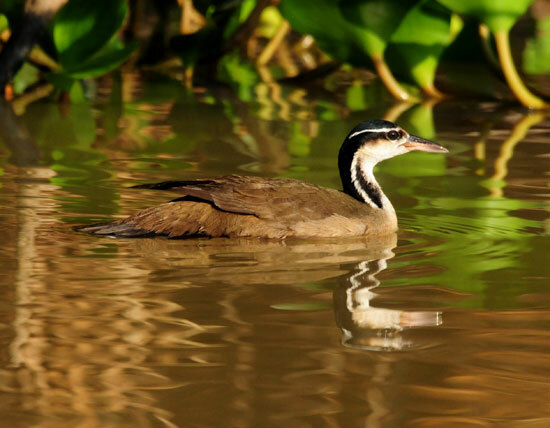 This is a great place to see the sought-after Agami Heron, as well as Sungrebe and a host of other water loving birds. The localised Morelet's Crocodile exists here and with luck we will see this and many other forms of wildlife. For those who are more adventurous we also plan a night excursion by boat to the Sacluc after dinner. Here we have more chances of the crocodile plus other night creatures such as Boat-billed Heron, owls and potoo and maybe even Baird's Tapir. Night at Guacamayas Biological Station. After an early morning coffee we will board our boat for a birding tour towards the archaeological site El Peru, where we will visit a nesting area of Scarlet Macaw, here at their most important breeding colony in Guatemala. Other interesting birds in this area include the beautiful Ocellated Turkey, Bat Falcon, Black-and-White Owl, Ornate Hawk-Eagle, Lovely Cotinga, Rose-throated Tanager, Green-Backed Sparrow, White-whiskered Puffbird, White-collared Manakin, Rufous-tailed Jacamar and even Geoffroy's Spider Monkey. After lunch and a little relaxation we will then go out later and check for birds around the lodge and the neaby lookout tower, which offers superb views of the forest canopy. Some of the birds we could encounter include Great Curassow, Yucatan Flycatcher, Pale-billed Woodpecker, Blue Bunting, and Red-capped Manakin. Tonight we might have another option for a nightime boat trip. Night at Las Guacamayas Biological Station. An early morning boat trip on the San Pedro River to see what we can find, followed by breakfast after which we will transfer to Tikal National Park, stopping en-route at Flores for lunch. Tikal is the largest excavated site in the American continent and contains some of the most fascinating archaeological remains of the ancient Maya civilization. Declared a world heritage site in 1979 it comprises 576 square miles of lush jungle surrounding one of the most impressive Myan ruins you could ever see. Birding around our lodge and the surrounding forest can be very rewarding and we will be making our first excursion into the park to see these amazing ruins at sunset, something few other tourists ever see. Night at Jungle Lodge. 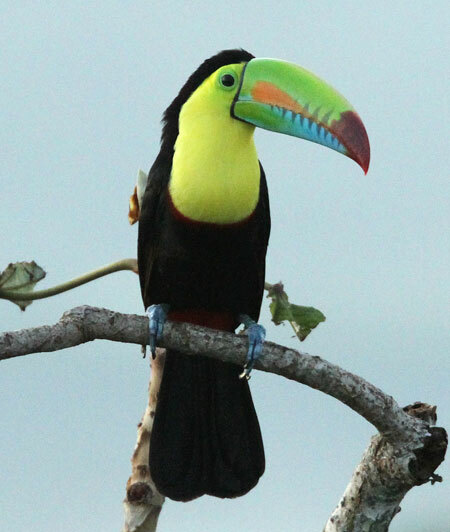 This morning we will visit Tikal National Park early when wildlife and bird activity are at their best. The monuments, remnants of the ancient Maya culture located in the middle of luscious jungles, are ideal places for birdwatching where we will find interesting species such as Ocellated Turkey, Orange-breasted Falcon which can often be seen perched high on one of the monuments, Yucatan Jay, Black Catbird, Rose-throated Tanager, Great Curassow, White-fronted and Mealy Parrots, Crested Eagle, Slaty-tailed, Black-headed and Gartered Trogons, Collared Aracari, Keel-billed Toucan, Chestnut-colored Woodpecker, Sulphur-bellied Flycatcher, Ivory-billed and Tawny-winged Woodcreepers, White-bellied Wren, Northern Schiffornis, Stub-tailed Spadebill, Montezuma Oropendola, and Green-backed Sparrow amongst many others. 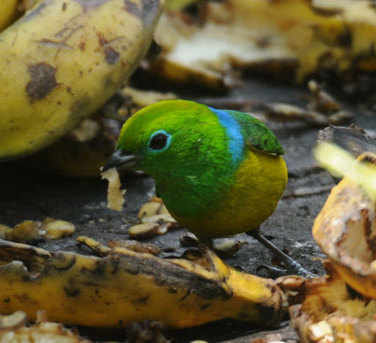 Wintering flocks of warblers, tanagers and others makes this destination a fantastic tropical paradise. After lunch we will have an archaeological tour of this site and then in the afternoon evening we can look for some tricky birds such as Yucatan Poorwill and Grey-throated Chat. In the evening we also have the chance to spot some of the parks more elusive mammals such as Ocelot, Margay, and even Jaguar! Night at Jungle Lodge. Today we will depart early for the transfer from Tikal to Flores airport in time to catch the local flight to Guatemala City for our international departure. Leaders: Nick Bray and local bird guides. Join the Zoothera e-mailing list for up-to-date news on new tours, tour reports and special offers. e-mail info@zootherabirding.com to sign up.